7 simple practices to make your own; reduce stress without ever leaving your desk, resolve back and neck pain effortlessly by releasing muscular imbalances, and manage your energy for more peace in the body and ease in the mind! This Stress Reduction and Energy Management System is a basic aid for improving your posture, easing back pain and enhancing your well being. Apply one or more of these simple movement and meditation practices daily, and you will see immediate positive results in your energy level and your body image. You can do everything with more ease and less stress if you only take the time to do these steps on a regular basis. Practice one or two a day if you only have a few minutes, or try the whole 7 step protocol all together and see what works best for you. Have fun, and let me know how it went for you! You are ready to learn the 10 minute Constructive Rest position. This is a classic position for ease. It will gradually reduce the tensions in the back and neck. First find three or four soft bound books, lie on your back, and place the books under your head. You will be lying down on a floor, not on your bed or the sofa. (Place a blanket or towel under you for comfort). Lie with your head on the books, the soles of your feet on the floor, with the knees bent and pointing toward the ceiling approximately 15 inches from one another. Make sure that you are comfortable and that the legs are not straining to stay upright. (if this is difficult for you to maintain, place a chair directly in front of your bottom and put the lower legs onto the chair). Notice that you can gradually ease the tightening of the muscles at the back of the neck, and that your back begins to settle and grow wider over the next number of minutes. Do this for at least ten minutes. (Note that if it is very difficult for you to keep your legs up, bring them a little closer together, and tie them with a cloth belt, or place the knees over a large pillow. Over time you will be able to perform the first position). Begin with 10 minutes of Constructive Rest, and then sit up. You will need a wall for this exercise. Place a small pillow underneath your seat, a larger one if your hamstring muscles are tight (those muscles on the back of the thigh which get pulled if they are shortened). Using the wall for support of your back, flex your feet at the ankles and stretch your legs out in front of you, about hip-width apart. (Note that hip width is not very wide, less than shoulder width). Hold this position for a few minutes while stretching into your heels. Do not try to get your back to the wall; instead, notice a small curve both in the lower back and in the neck. Let these curves remain. Try to stay upright; do not allow the pelvis to tuck. Upright is a sitting position where the sitting bones, those curvy balancing points on the bottom of your pelvis, are facing straight downwards. Think of your head releasing and de-compressing from the neck and gently releasing toward the ceiling. Do not tighten your back, but instead think of it as wide. If this is still too difficult to do sit on a chair and stretch one leg at a time out in front of you while flexing the foot at the ankle. Your body has taken years to develop the habits of strain that limit your movements. Please be kind to yourself, and do not try and go further in your practice than your body is ready for. Tight muscles must be gently coaxed into suppleness. This goes for all of the exercises in the Strategies for a Better Back!) Do not press your head to the wall. It will be as if you still had three small soft-bound books behind it, to maintain the curve of the neck. Begin with 10 minutes of Constructive Rest, followed by the Straight leg Stretch for 1-3 minutes. Today you will begin to stretch the spine and to develop some deeper breathing patterns. Get on your hands and knees, with the fingers stretching out as open as is comfortable for you, and on the next exhalation tuck your chin in gently (do not press), while tucking the pelvis. You should feel a nice stretch of the lower back. Hold this for a few breaths in and out. Then, just relax the pelvis the other direction while gently looking up to the ceiling. Hold this for a few breaths. Think of the spine as long, and try to maintain as much length as possible while repeating the exercise 4-5 times. Now drop back onto your heels while the arms remain outstretched in front of you and let your forehead relax toward the floor. This is called Child’s Pose in Yoga, and is a well known position of release and relaxation. Get to know this position. There is much to be discovered here, including a letting go of the shoulders. If this position is uncomfortable, place a pillow between your buttocks and your lower legs, for support. You will gradually develop the flexibility to stay longer, and without support. This is a meditation practice. You will be sitting in a chair for 10-15 minutes. Begin as usual with 10 minutes of Constructive Rest, followed by Leg Stretch, Cat Stretch, and Child Pose. Then come to the front of a straight-backed chair. (For more comfort, place even sized soft-bound books, approximately one inch in height, under the BACK two legs of the chair. This will change the way the pelvis rests on the chair and provide an easier release for the legs while sitting). Place your hands on your thighs, let your head nod slightly down but do not let the neck drop down with the head, and close your eyes. Notice your breathing. Make sure that your ribs are expanding outward on the inhale, and releasing a bit on the exhale. Do this breathing slowly but not labored. Continue to notice muscular tensions as they come up, and try to release them. For example, you may notice the shoulder girdle getting tight. Just let it relax and drop. You may notice the thighs getting tight or pulling in toward the pelvis. Release them and let the feet relax onto the floor. This is a practice of awareness and being present with yourself. As you sit, you will notice many sensations and thoughts. When you notice thoughts coming, simply say to yourself, “I am breathing in and I am breathing out”. There are no judgments, only observations. You have now begun the daily practice of meditation, which will bring great calm into your life as you continue to practice daily. This form of stress reduction includes some guided imagery and chanting. I use a very beautiful and simple chant upon waking in the morning, along with some quiet breathing techniques (see the “whispered ah” to follow). You will begin in a seated position, either at the front of a chair with both feet on the floor, or leaning toward the back of a chair or straight-backed sofa with legs crossed easily in front of you. (I recommend putting a pillow behind you so that you feel the support but are not pressing or sinking back into the support. Instead, you are using the chair itself to support your back in a quiet way.) The hands are resting on the lap with the index fingers and thumbs touching, palms facing up. 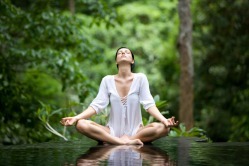 Begin by quietly breathing in and out for a few minutes without holding the breath or forcing the breath. Then bring the hands to the center of the heart area, and cross one hand on top of the other, palms on the sternum (otherwise called the “breast bone”). Visualize a golden glowing light within your heart center, which gently grows larger and larger, like the light of the sun. Now begin a slow “AaaaaayEeeeeeeeeeMmmmmmmm” (Aim) on the exhalation until all of the breath has been exhaled, followed by a slow and easy inhalation. Try to maintain a “Buddha smile, where the corners of the mouth are gently raised into an inner smile, just like you’ve seen on the statues. This is an attitude of repose. Repeat 7 times. End by feeling the effects, and sit quietly with eyes closed for as long as possible. Begin with 10 minutes of Constructive Rest position, and the Straight Leg stretch for 1-3 minutes. Follow with the Cat Stretch, and then the Child’s Pose for a few minutes. Today you will work with weights. Find three pound weights. (I work with three pound weights because any heavier will add strain to the neck. Eventually more weight can be added). In the standing position, place your legs less than hip-width apart while holding the weights. Allow your arms to hang at your sides and breathe in and out a few times. Notice whether you are pressing the head back on the neck in order to look out, and gently lengthen the back of the neck by nodding your head slightly forward, and then just let it balance while thinking of it gently easing upward toward the ceiling. You will not do anything, but let it be a thought only. You may find that you are in a different balance, and that it feels unfamiliar. This is a new balance that will actually allow your spine to lengthen! Begin by tightening the abs just a little bit, by gently drawing your belly to the spine and think of scooping in and up, hollowing out the belly area. Now begin flexing the elbow of the Right arm so that the hand and fingers are facing upward, and bring the arm in close to your shoulder. Then, as if the fingertips could lead the arm, bring it straight up toward the ceiling while rotating the lower arm. Your fingers will be facing forward by the time you get there. Now turn the wrist so the fingers are facing out toward your right side and lower the arm all the way down to your side. Finally bring the arm straight out to the side, up to shoulder level and back down. Repeat 3-4 times. Then do the same with the left arm. This exercise will build some tone and strength in the arms, while maintaining good use. Follow this with 15 minutes of sitting meditation, or go out for a half hour vigorous walk while holding the weights. Begin as before, with 10 minutes of Constructive Rest, and 1-3 minutes of the Leg stretch at the wall. Then do your Cat Stretch and Child’s Pose. Go to the Standing weight work, repeating the exercise 3-4 times with each arm, and today, do both arms simultaneously at the end. Now you are ready for the Whispered Ah, a breathing procedure developed by F. M. Alexander (1869-1955) for re-educating respiratory co-ordination. Place your hands on your lap with the fingers facing upward, and bring the hands a little closer to the hip joints. Make sure that you are sitting on your sitting bones, and that you have nodded your head slightly forward as you have kept you neck released. This will allow for your spine to lengthen naturally, and for your back to widen. Make sure that the nod is at the very top of the spine, much higher than we usually think it is, so that the neck does not get pulled forward by the nodding of the head. You will now create a slight “Buddha” smile and place the tip of your tongue on the lower teeth. This encourages your tongue to relax. The tongue often tightens by pulling back toward the back of the throat. While thinking of something pleasant, exhale and open your mouth very simply, and let an “Ah” sound come out. It will be a whispered Ah, not a vocalized one. At the end of the exhale, close your lips and wait. Then breathe in. We do not need to “take” a breath, nor do we need to push the breath back out. After air comes into the lungs, the diaphragm releases and the ribs release down to their resting position, creating a slight oval shape to the ribcage. Meanwhile the spine stays long, because it is not required to move as part of the breath’s activity. Neither does the head have to get pulled into the action. Let the head stay balanced and poised while breathing takes place. Do this practice for just a few minutes a day at first, increasing the time as you feel comfortable. After you have learned to do this while sitting, you can try to practice it while lying down, leaning against a tree, while driving, or in bed just before sleep. It is very relaxing and restorative to the body and mind, and can be an aid for sleeplessness as well. You have now completed the whole System! For the next step in your Stress-Free life, find a certified Teacher of the Alexander Technique in your area, and take some private Alexander lessons! You will learn life-long skills for reducing body tension. The Alexander Technique is a learning method to help people of all ages and abilities change the habits that limit freedom of movement caused by ordinary misuse of the body. The Alexander Technique is designed to help you change postural habits and help you eliminate back and neck pain. This hands-on technique will help you experience the kind of free movement you once knew as a child, help you improve your posture, co-ordinate your breathing, and a whole lot more. Diane Young is a Certified Teacher of the Alexander Technique, M.AmSAT, Certified Pilates Instructor, CranioSacral therapist, and Coach. Diane offers one-on-one private sessions in person or Virtual (over the phone) to address your issues with pain, posture, and fatigue. Call today to get a 20 minute Strategy session (Value $79) with Diane. You want to lose weight but don't know how? Hate how you look in the mirror? Wish you could do something about the fatigue that follows you around all day long? Just want to feel better in your own body? Want the body back that you once had? Also, please visit our website www.soulconnectionhealing.com to find out about other coaching opportunities and products. You will be happy you did!